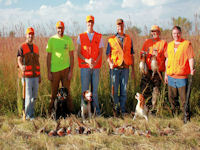 On opening weekend of our pheasant season always welcomes a family pheasant hunting party. The hunters all tried their hand at some trap shooting before hitting the fields. 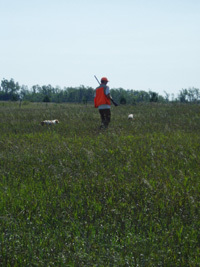 It was a cool September day which offered excellent hunting for the dogs and hunters. Beat the crowds and schedule a September hunt. It can be a little warm at times but we can get around that problem by hunting early mornings and late afternoons. We encourage hunters to take advantage of this opportunity. 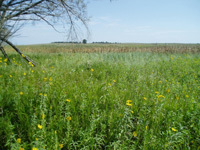 Combine a little fishing or golfing with a hunting trip at Lake Cochrane for walleye or bass, Lake Oliver bass or shoot a round (9 hole course) of golf at the Gary Municipal Golf course or the new Prairie View Country Club.. Sitting here looking out the window there sure is a pile of snow outside. The tall grasses at the farm are holding some the blowing snow back from the sloughs where the pheasants are making their homes for the winter. Getting back to the slough now can be a challenge but can be access by using snowshoes to get to the reward. If we get some thawing weather a March hunt might still be possible. The season closes on March 31. It is never to early to call us and book a fall hunt. The season starts again on September 1. 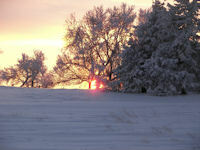 Winter does provided for some great pictures. These were taken at sunset. Top one is our backyard and the bottom picture was taken at the farm. I am always excited at this time of the year as I look forward to renewing old friendships and making new ones. It is a very busy but fun time for us. The summer has been quite dry but we have had timely rains. The cover is looking great and most of the watering holes have water in them so the dogs can get cooled off. We have seen many pheasant broods ranging in age from newly hatched to full color. Just a reminder; We still openings but many dates in October are full, but September and November are great times to hunt. Work on Gate City Lodge was started in January of 2007. 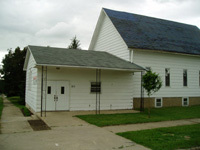 Six rooms all with private baths, 2 lounges were created in the old Lutheran church. The basement kitchen was completely remodeled. 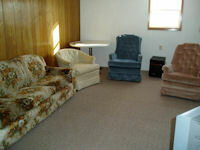 In the winter of 2008 four more rooms were added on the upper level, all with their own baths and another lounge area. We remodeled the main floor lounge to accommodate the new stairway for the upper level and created a exit door on the east side of the lodge with a cement patio. In the summer of 2008 new sidewalks and curb and gutter were installed.